Nutrition is a vital aspect of treatment planning for hospitalized patients with severe illnesses and those with chronic diseases. Critically ill animals require nutritional support. Patients with chronic diseases also have nutritional requirements that should be addressed as part of their treatment plan. 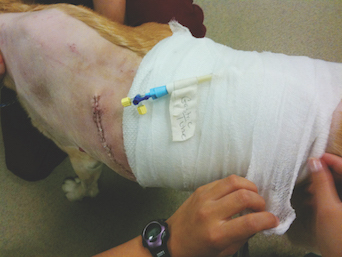 “When patients are critically ill, they are constantly in a breakdown state,” said David Liss, RVT, VTS (ECC, SAIM), CVPM, in a presentation at the 2017 Atlantic Coast Veterinary Conference in Atlantic City, New Jersey. Seriously ill patients burn calories constantly. If they do not receive adequate nutrients through feeding, their bodies begin to break down skeletal muscle in an effort to recruit protein. Catabolism of protein adversely affects wound healing, immune function, and strength. All hospitalized patients should receive nutritional assessment, said Liss, who directs the veterinary technology program at Platt College in Los Angeles and works as a relief intensive care unit technician at VCA Veterinary Specialists of the Valley in Woodland Hills, California. Nutritional management should be included in the treatment plan from the beginning, not added as an afterthought. Hospitalized patients can receive nutrients through either enteral or parenteral feeding. Enteral feeding—nutrition delivered via the gastrointestinal tract—is preferred when possible because it supplies nutrients directly to the cells of the digestive tract. Voluntary feeding, force feeding, and tube feeding are all methods of enteral feeding. Liss does not recommend force feeding because it increases the risk of aspiration and can cause patients to develop food aversion. Force-fed patients also may not receive the intended amount of food, because rejected food tends to be slung onto walls or into towels. However, he noted that oral feeding via syringe is suitable if a patient readily accepts it. Feeding tubes are helpful for many hospitalized patients, Liss noted. Nasoesophageal tubes can be placed noninvasively and are usually well tolerated, especially by cats, he added. Nasogastric, esophagostomy, gastrostomy, and jejunostomy tubes can also be used. Tube selection depends on the patient’s needs. For example, nasoesophageal tubes are intended for short-term use, whereas gastrostomy tubes can be used long term and require endoscopic or surgical placement. Various calorie-dense diets are available for tube feeding. The amount to feed is based on the patient’s resting energy requirement. Parenteral nutrition, which bypasses the digestive tract, is delivered intravenously. This type of feeding is used for patients who cannot receive enteral nutrition. Total parenteral nutrition typically requires a central venous catheter. Patients receiving parenteral nutrition need intensive monitoring because of the increased risk of sepsis and metabolic complications. Nutrition can be part of the treatment of nearly every disease, Liss said. He discussed the nutritional management of 5 diseases common in veterinary patients. Chronic kidney disease (CKD) progresses slowly over time, and patients may not present for treatment until they are quite sick. Testing blood symmetric dimethylarginine (SDMA) levels may enable practitioners to diagnose disease earlier, Liss said. The International Renal Interest Society (IRIS) has published guidelines for staging kidney disease. IRIS kidney disease classifications are based on blood creatinine levels, with suggested modifications based on blood SDMA concentrations. IRIS treatment recommendations for each stage include dietary modifications that may mitigate the clinical effects and slow disease progression. Patients with CKD often have hyperphosphatemia as a result of decreased renal excretion of phosphorus. Elevated blood phosphate levels can lead to secondary hyperparathyroidism. Some patients have elevated parathyroid hormone levels even if they have normal blood phosphate levels. Reducing phosphate intake is recommended for patients in all but the earliest stage of CKD. Phosphate restriction can be accomplished in 2 ways: feeding a phosphate-restricted diet and adding enteric phosphate binders to the food. Strict dietary protein restriction is not recommended for patients with CKD, Liss said, as dietary protein deficiency can lead to muscle wasting. However, mild protein restriction may be indicated in some stages. Dietary protein should be highly digestible. Serum potassium levels are often low in patients with CKD. For this reason, most clinical renal diets include extra potassium. Patients with CKD also may develop metabolic acidosis, which can be diagnosed with blood gas analysis. Renal diets usually contain alkalinizing agents to help restore the acid–base balance. Polyunsaturated fatty acids, such as omega-3 fatty acids, can help preserve renal blood flow, Liss said. They are typically added to clinical renal diets. Because patients with renal disease are polyuric, their stores of water-soluble vitamins, particularly B and C vitamins, become depleted. Some need supplementation of B vitamins beyond the levels included in renal diets, Liss noted. Liss recommended monitoring body condition scores to ensure that patients are receiving sufficient calories. Appetite stimulants, such as mirtazapine, can help in the short term but are not intended for long-term use. He stressed the importance of continuing to monitor calorie intake in patients receiving appetite stimulants. “Just because you give mirtazapine and the patient eats a couple of kibbles doesn’t mean it’s eating the full caloric requirement,” he said. Pancreatitis occurs when pancreatic enzymes that usually digest food are activated abnormally and begin autodigesting the pancreas. The disease is often idiopathic, and the inciting causes are not fully known, but dietary fat has not been proven definitely to cause pancreatitis, Liss said. In the past, the mainstay of pancreatitis treatment was fasting the patient to “rest the gut.” The idea was that the taste, or even odor, of food could stimulate pancreatic enzyme production, exacerbating inflammation. Liss said that this theory was based on results from decades-old studies in humans that show that patients with acute pancreatitis became nauseated when they smelled food. However, prolonged fasting is no longer recommended. Current evidence suggests that patients with acute pancreatitis should receive enteral nutri- tion as early as possible. Feeding does not appear to worsen nausea or abdominal pain and may help patients recover, Liss said. Patients with acute pancreatitis should first be stabilized and treated with intravenous fluids and antiemetics. Ideally, feeding should begin within 48 hours after presentation; however, it can be initiated within 12 to 24 hours in some patients, he said. Extremely low-fat diets have traditionally been recommended for dogs with acute pancreatitis. Liss suggested that unless patients have a known disorder of fat metabolism (eg, hypertriglyceridemia in schnauzers), strict fat restriction may not be necessary. Highly digestible diets, preferably with polyunsaturated fatty acids as the fat component, should be used. Cats with pancreatitis do not require dietary fat restriction, he said. Patients with acute pancreatitis often benefit from feeding tube placement. Liss said in his practice nasogastric tubes are typically placed in patients with acute pancreatitis within 1 or 2 days of presentation. The liver is responsible for metabolizing and synthesizing protein. It also regulates the detoxification process. Dietary protein is the main concern in patients with liver disease, Liss said. Whether dietary protein levels should be adjusted depends on the type of liver disease and the patient’s protein tolerance. Patients with some liver diseases, such as cholangitis and feline hepatic lipidosis, may not need dietary protein restriction. In these diseases, the liver does not metabolize amino acids normally. If patients with these conditions do not receive enough dietary protein, their bodies will catabolize their own lean muscle for protein, potentially increasing blood ammonia levels. If the disease progresses, patients who did not need dietary protein restriction at first may require it later. Patients with portosystemic shunts, congenital or acquired, require a protein-restricted diet. These patients’ livers cannot adequately detoxify ammonia in the blood. Elevations in blood ammonia can cause hepatic encephalopathy, which is characterized by neurologic signs ranging from mild dullness to seizures. Patients with portosystemic shunts or evidence of hepatic encephalopathy also may need diets with dairy- or vegetable-based protein rather than meat protein because the former are less likely to increase blood ammonia levels. Complex carbohydrates and soluble fiber reduce nitrogen production by gut bacteria and therefore are helpful for patients with liver disease, Liss said. Patients may also need mineral supplementation. However, those with copper storage disease (which is hereditary in Bedlington terriers) or elevated blood copper levels secondary to liver disease require dietary copper restriction and possibly chelation therapy. Vitamin supplements, particularly vitamins E and K, may help patients with liver disease. Nutraceuticals, such as S-adenosylmethionine, are often part of the treatment plan and have few adverse effects, Liss said. Liss discussed 2 dietary modifications for patients with urinary tract disorders: increasing water intake and, if applicable, acidifying the diet to help dissolve stones. Urinary tract diets typically have elevated sodium levels to encourage water drinking, he said. For this reason, these diets are not suitable for patients who also have heart disease. Liss also discussed increasing cats’ water intake by feeding a canned diet, using a water fountain, or adding flavorings to water. Struvite calculi form in alkaline urine. They can often be dissolved over time by feeding a diet that acidifies the urine and is low in the minerals that make up struvites, Liss said. Calcium oxalate calculi form in a wider range of pH levels and cannot be dissolved with diet. These stones require surgical or other types of physical removal. Nutritional goals for patients with heart disease include restricting sodium, maintaining protein intake, and correcting nutrient deficiencies, Liss said. Salt intake increases intravascular volume, which can lead to pulmonary edema in patients with cardiac insufficiency. The degree of dietary sodium restriction depends on the patient’s stage of heart disease. Because these patients may lose muscle mass, it is important to ensure that they continue to eat and that their diets contain sufficient protein. Taurine is a dietary requirement for cats. A deficiency of this amino acid causes dilated cardiomyopathy. Complete and balanced commercial cat foods include taurine, but cats that eat homemade or vegetarian diets can develop taurine deficiency. This deficiency can also occur in certain canine breeds, so dogs that develop dilated cardiomyopathy may need to have their blood tested for taurine level. Omega-3 fatty acids may benefit patients with heart disease. Some cardiologists recommend fatty acid supplementation, and some diets formulated for patients with heart disease contain fatty acids. Hospitalized critically ill patients and those with chronic diseases need nutritional support to recover from illness and to prevent breakdown of fat and lean muscle. Nutrition affects outcome in patients with chronic illnesses and can be part of the treatment plan for most conditions. Dr. Walden received her doctorate in veterinary medicine from North Carolina State University in 1994. After an internship at Auburn University College of Veterinary Medicine, she returned to North Carolina, where she has been in companion animal general practice for over 20 years. Dr. Walden is also a board- certified editor in the life sciences and owner of Walden Medical Writing.